The underground storage that is anticipated to be demonstrated in the Netherlands is an aquifer thermal heat storage (ATES) concept in combination with 2 km deep geothermal wells allowing for heat to be used directly for heating ~100 hectares of (agriculture) business. Three geothermal heat sources (doublets) are in operation A preliminary design for the ATES has been developed and the permitting procedure is in preparation. The temperature level provided by the geothermal heat source is 92°C. The geothermal wells have surplus heat in summertime which can be stored by using an ATES system. The ATES system pre-design constitutes two wells (1 doublet) storing heat in an aquifer at 300- to 400-hundred-meter depth. Water treatment: Within the agricultural business there is a supply chain for CO2 available. In theory it is possible to use CO2 for water treatment, instead of the more common hydrochloric acid. One of the goals is to have a more in depth theoretical research on water treatment with CO2 and to monitor the results of the application of CO2 injection. Material selection: ATES has a different technical characterization from geothermal well. So instead of using the same materials as for the geothermal well, it might be possible to identify cost reducing materials for making the wells and pipes. Pump selection: Past experience shows that pump selection is an important aspect. Attention will be made to select the right pump to increase lifetime, while keeping total cost of ownership as low as possible. Storage efficiency: Groundwater models can predict the storage efficiency. Do they predict this right? By monitoring the ATES system the storage efficiency models can be verified supporting to a better use of the models in future projects. Insulation of well: Does insulation of the ATES wells help prevent environmental impact. And does it also contribute to storage efficiency? Demonstrate a full scale ~90°C HT-ATES system in a real case setting. Advance HT ATES to commercial scale demonstration. Field lab for system integration & grid optimization tools CHESS and HEATMATCHER. Permit received for ATES system. Drilling of the monitoring well in March 2019. NIOO-KNAW has established a unique pilot HT-UTES facility for aquifer thermal energy storage at 45°C at 300 m depth in collaboration with industrial partners and the Province of Gelderland, the Netherlands. This pilot is operational since 2012. NIOO-KNAW has acquired data for this facility for its subsurface effects on temperature, soil, groundwater and microbial composition through measuring technology and chemical and biochemical analysis, as well as data on above-ground – below-ground heating system integration. 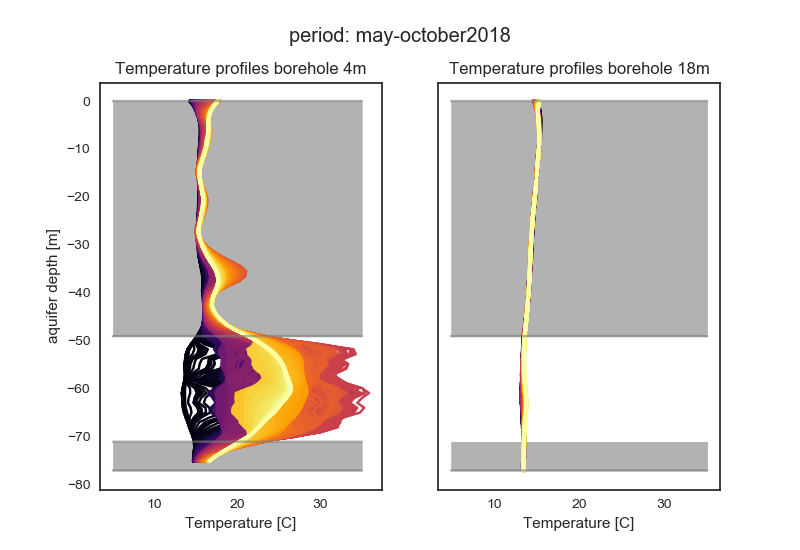 These studies have yielded datasets which can be analysed and used for establishing guidelines and basic assumptions for new designs and pilot facilities in the HEATSTORE project. NIOO-KNAW will share the existing data of its HT-UTES facility as well as to monitor and validate parameters of interest in the HEATSTORE project. HT-ATES Koppert Cress greenhouse: Conversion of low-temperature ATES to high temperature (45°C) ATES. 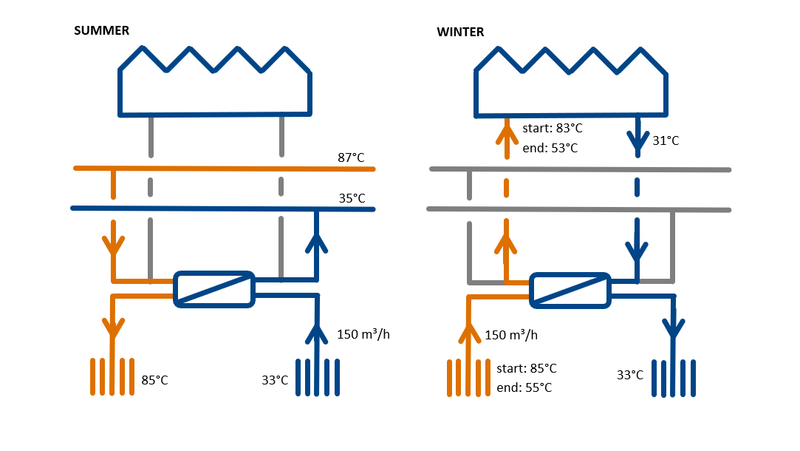 The heating demand of Koppert-Cress proved to be much higher than expected, which resulted in a very large imbalance in the ATES system towards the cold well. Now with solar heat collectors and heat recovery from the cool-wcell connected to the warm well more heat can be stored, which reduced allowed minimization of having to run running of the heat pump. Monitoring results and experience from this current transition from low to high temperature ATES are used in HEATSTORE. Koppert-Cress is located in an area with high potential for geothermal mining, it is investigated in this case study to what it is possible and beneficial for them to extend their current transition to even higher temperature storage in combination with geothermal mining. Figure 1. Raw temperature data from distributed temperature sensing (DTS) performed at HEATSTORE case study Koppert-Cress.